Brinji sadam / Plain Brinji Rice is a popular rice recipe in Tamil nadu. 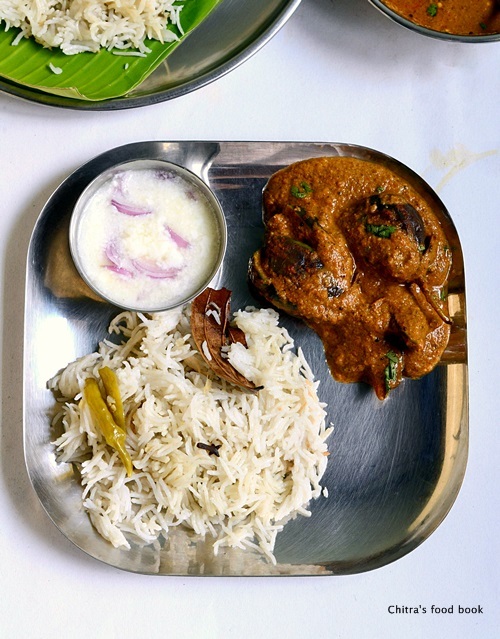 It is served with Vegetable kurma or Brinjal gravy as side dish in marriage feast and road side hotels. My friends in Chennai have told me about this rice. But I don’t have any idea as I have neither tasted nor seen it.Last week I saw a picture of brinji rice along with brinjal gravy/Kathirikai kurma in facebook’s Food-fun-friends group.I really got tempted by the picture and asked the recipe.Special thanks to Edwin Edy for sharing the pictures of brinji rice & Brinjal gravy for biryani from a Tamil magazine.I tried brinjal gravy by referring that recipe and Mye’s blog.For this brinji recipe,i referred many blogs,asked some of my friends and tried it. Its a very simple and easy recipe without any masala grinding job. Its more like simple pulao recipe. I am not sure whether this is the authentic brinji recipe that is served in Hotels & marriage feast because I found so many variations for this particular recipe. I did not add any vegetables here & I have made it as plain coconut milk pulao. It tasted awesome with this brinjal gravy. To enjoy brinji’s best flavor,u must try it with some spicy side dishes like kurma. Non vegetarians can try with egg gravy, chicken gravy or prawn curry as mentioned by my friends. But vegetarians have few side dish like kurma, brinjal gravy, salna. I have shared a seperate post for brinjal gravy because this post will become too lengthy if I share it here. I have also shared another version of brinji using with vegetables and masala. 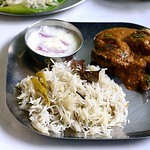 Now lets see how to make plain brinji rice @ biryani leaf / bayleaf pulao recipe with stepwise pictures. Plain Brinji rice recipe-a popular rice variety of Tamil nadu made using rice, coconut milk and spices. Wash and soak the basmati rice in enough water for 30 minutes to 1 hour.Drain the water completely and roast the rice in a kadai adding 1 tbsp of ghee for few minutes.I din’t roast the rice here. Now heat oil+ghee in a cooker base and saute the whole spices one by one.Then add the finely chopped onions,g&g paste and slitted green chillies.Saute till onion turns transparent.Don’t allow the onions to turn golden brown because the color of rice may not come white. Lastly add the finely chopped coriander & mint leaves( optional) and saute well.Add turmeric powder if u wish.In some hotels,they add and in some places,brinji is white in color. Add the rice,water and salt.Check for taste and pressure cook in low flame for one whistle. After the steam is released,open the cooker and fluff the rice with a fork.Serve with any kurma or gravy ! There are many variations for this recipe.Some recipes have used ground masala and some recipes call for chilli powder & dhania powder.Here i have shared a very simple version like plain pulao. This rice tastes the best only with a spicy side dish like brinjal gravy which is said to be an ideal and most popular side dish for this brinji rice. 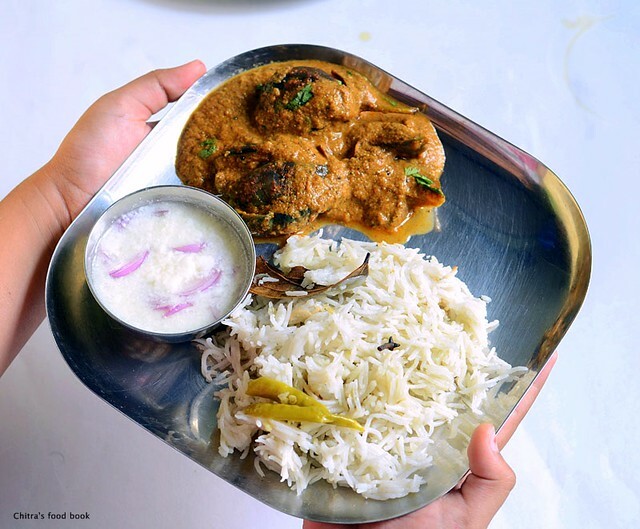 Try this brinji rice with brinjal gravy.Tastes yummy ! Brinjals being my fav, this one bookmarking. Surely going to give it a try. Thanks a lot for sharing. Hi chitra i was expecting this recipe in this one pot series.as u said there r so many variations.i have seen double beans and coconut milk being used .and brinji kurma is the popular combo.is that the same kurma we eat with chappathis?i dont remember.and thanks for the recipe.